Hey guys, I ran a dyno the other day and I want to know what you guys think about it. Those are very very nice results from the mods you have. Now get you a header and try for that 200whp mark!!! Oh I know you have a header. But dc headers are pretty much stock replacement. They net VERY minimal gains. 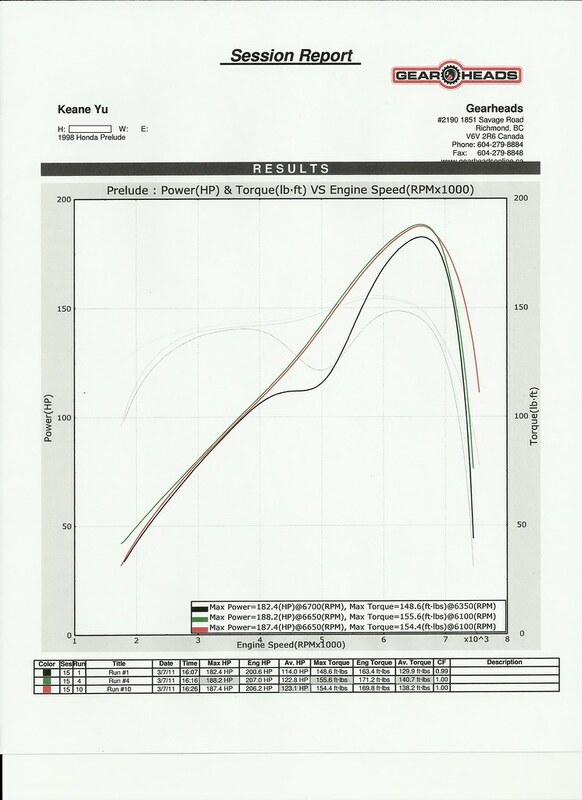 A real header for our motors normally cost about a grand and will produce around 10whp. Or you can go with a hytech replica. Those are about somewhere around $400 I think. Not sure. Good results man. Btw I can get hytech reps for any one interested. Pm me. dont 5th gens have around 180hp stock? supposedly. its more like 155ish. dc headers r pointless on a h22. im pretty positive they r exact replacements. same tubing diameter n stuff. more of a dress up item. hytech rep is from what i understand the best bang for the buck. if money aint a thing id suggest a real hytech or a bisimoto. How about throwing in some type s cams that should do the trick also..
since you already have a prelude power account just talk to kronn98. he has a group buy for hytec replica and they're $320 shipped in the u.s not sure how much more for canada though. Are hytec reps that much better than stock headers? I am pretty interested in this now. Damn, i wanna get my hands on one of those header now. not sure if he does single orders or not. when i ordered mine through him the group buy was over i think. it's always worth a try might get lucky. well thats what they claim... but im with you its a lot for a bolt on. Heres the vid of a h22 swapped delsol with that header. if you havent seen it that is..
Haha i agree man. i want one to:P eventually! Last edited by iloveboobies; 03-17-2011 at 01:55 AM.